Located in the eastern coast of Sicily, Italy, the Plemmirio Marine Protected Area (MPA) covers an area of 2400 ha. Plemmirio was established with the aim to protect marine biodiversity and improve awareness regarding the marine environment and promote social and economic activities linked to the marine environment in the area. Plemmirio is managed through a zoning approach and it is divided in three different areas (zone A, zone B, and zone C). The MPA is included in the SPAMI list (Specially Protected Areas of Mediterranean Importance) sine 2008 and was established in 2004 by the Italian Ministry of the Environment and Protection of Land and Sea. How does MPA zoning contribute in achieving marine conservation targets? 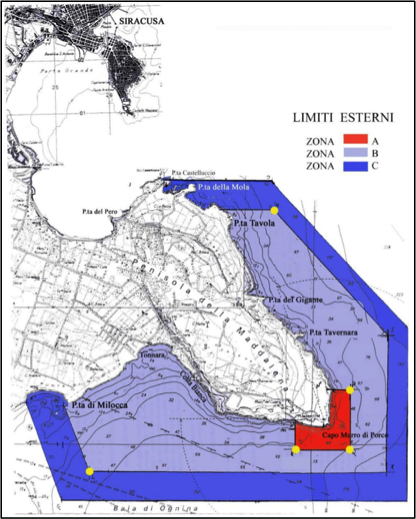 In Italy there are currently 30 MPAs formally established and these include one or more no-take/no-access zones (formally classified as A zones), surrounded by two buffer zones (defined as Zone B and Zone C, where restrictions to human uses, including fishing, become progressively softer). The Plemmirio MPA has been established in 2004 by the Italian Ministry of the Environment and Protection of Land and Sea with the aim to protect the marine and terrestrial environment of the area (Figure 1). 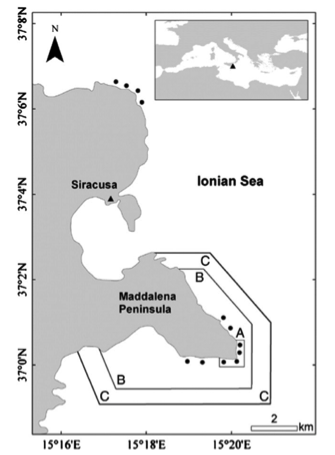 Located in the eastern coast of Sicily, Italy, the Plemmirio Marine Protected Area (MPA) covers an area of 2400 ha (see Figure 2). The main objectives of the MPA are: a) to protect and safeguard the local coastal and marine environment and biodiversity, especially the posidonia beds and the coralligenous biocenosis; b) to promote environmental education and the dissemination of knowledge of the marine and coastal environments; c) the implementation of research and monitoring programmes in order to improve systematic knowledge of the area; d) to promote sustainable development of the area. The objective of the case study was to understand whether a zoning approach to the management of MPAs result in better environmental protection outcomes compared to non-zoning strategies. A zoning strategy with different levels of protection appear to be the most effective in protecting the biodiversity within the Plemmirio MPA. The success of this MPA is not only dictated by the choice of ecological characteristics of Zone A (reserve) but also due to the high level of surveillance and enforcement. Indeed, enforcement and compliance are two essential requisites for an MPA to be effective in the protection of the marine environment and biodiversity (Pierpaolo et al., 2013). Albeit zoning plays a fundamental role, it should be stressed that within the Plemmirio MPA, awareness is also an equally important aspect that is carried out by the MPA management bodies with the aim to increase local awareness regarding the importance of having established MPA and the benefits produced by the zoning system. The Plemmirio MPA is divided in three main areas, which are subjected to different environmental protection schemes. The main areas are A, B, and C. Zone A is the integral reserve and is 80 hectares. Zone B is 1470 hectares. And Zone C is the external part and is 950 hectares. Scientific research is allowed in all three areas while bathing and swimming is only permitted in zones B and C. Individual immersions are allowed in zone B and C but only under the authorisation of the management body. Furthermore, certain diving activities are also allowed in zone A under strict control by the managing body of the MPA. The zoning approach can be implemented in other regions and countries as it is merely a management decision. Zoning in different locations could produce diverse effect and it is important to note that awareness plays an equal fundamental part in achieving effective protection of the environment.